Also known as: quad screen splitter, HDMI multiviewer, four video sources displayed on one monitor, 4-port USB HDMI KVM switch built-in quad splitter, 4-channel video mixer. 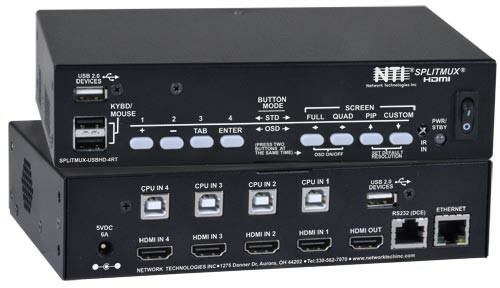 The SPLITMUX® HDMI Quad Screen Multiviewer with Built-in USB KVM Switch allows you to simultaneously display video from four different computers on a single monitor. Additionally, it can switch one of the four attached computers to a shared keyboard and mouse for operation and to two additional USB devices. It is capable of displaying the video sources in quad, PiP, full, or custom mode. In custom display mode, each of the quadrants can be adjusted to any size and positioned to any location on the display. Switch one of the four attached computers to a shared USB keyboard and mouse for operation. Supports 2K resolution 2048x1080, HDTV resolutions to 1080p, and up to 1920x1200 (WUXGA). Switch audio independently of video from connected HDMI sources. Built-in 2-port USB hub - switch devices between connected computers. In Full Screen mode, USB touch screen monitors can be used to control the connected active computer. Boots PCs, SUNs, and MACs simultaneously. HDMI-embedded audio switching (four-channel stereo, non-mixing or one channel stereo, mixing). Provides support for high-speed (480 Mbps), full-speed (12 Mbps), or low-speed (1.5 Mbps) USB devices. Supports HTTP REST API to configure SPLITMUX-USBHD-4RT with response in JSON format. Use keyboard or mouse commands to select display mode and to select port. In quad mode, the screen is split into four fields of equal size each displaying the entire contents of the corresponding input. USB touch screen monitors can be used to control the connected active computer. In PIP mode, the full screen display of one of the four video sources is accompanied by one, two, or three small images (thumbnails) of the three other video sources on the right hand margin of the screen, allowing simultaneous monitoring.